We offer programming in three sessions (Fall, Winter, Spring) from September to June, and limited courses in the Summer. We also offer low-cost (and free) Drop-In programs for all age groups. Pre-registration may be necessary for some Drop-In programs. Click here to download the Spring 2019 newsletter and program offerings. Winter 2019 Program Registration starts November 20 @ 8:30 am. You can register safely and easily online, using the City of Kitchener's Active Net portal. If you have no Internet connection, or to pay in cash, drop by any City of Kitchener Community Centre. City staff will be happy to assist. Download the waiver form for adult programs to sign and return by the first class. Download the waiver form for children and youth programs to sign (by a parent or guardian) and return by the first class. 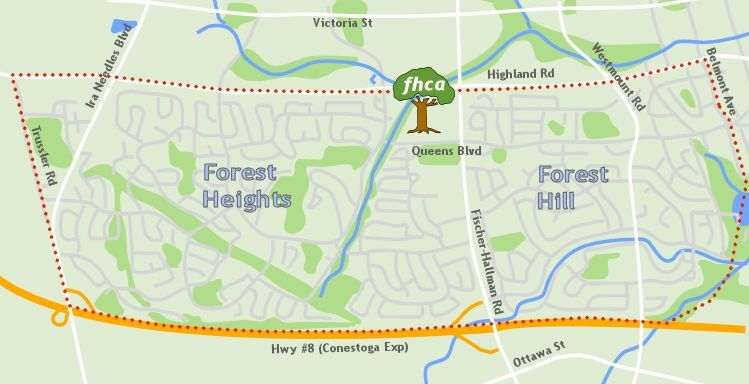 Forest Heights Community Association Inc offers regular programs and activities throughout the fall, winter, and spring. As of 2015, the FHCA offered two adult Yoga courses in the summer. The FHCA newsletter is delivered to homes in the Forest Heights, Forest Hill, and surrounding area three times a year. The Active Kitchener is delivered to all homes in the City of Kitchener four times a year. Information for the upcoming session is available on this web site and WEBreg at the same time as the door-to-door delivery. The following chart shows when program information is available for each session. If you or your child has a disability or special need and requires accommodation to participate in programs, one-to-one assistance may be available. Please call 1-866-969-9994 or 519-741-2229(TTY) for more information. Participants may withdraw from a program online or at the centre 7 days prior to the start of the program. After that time, any refund request must be DOCUMENTED with an explanation of circumstances. Requests will be adjudicated by the Association for a determination. If an entire program is cancelled, a full refund will be issued. Requests to transfer programs must be made prior to the third class taking place and will be based on program availability. Transfers after the third class must be approved at the program supervisor's discretion. If the centre is closed, all programs are cancelled for the entire day. Programs are no longer cancelled automatically due to school closures. Check your local radio stations or visit www.kitchener.ca for updates. Classes cancelled due to inclement weather will be rescheduled if possible.